2304 is a duplex (ferritic/austenitic) stainless steel grade with a useful combination of corrosion resistance and high strength. Because it has almost no molybdenum the grade is an economical alternative to 316 in some applications. 2304 is not generally suitable for use at temperatures above 300°C as it suffers from precipitation of brittle micro-constituents, nor below -50°C because of its ductile-to-brittle-transition. Good general corrosion resistance; approximately the same as Grade 316 in most environments. Good resistance to localised corrosion including intergranular, pitting and crevice corrosion; the Pitting Resistance Equivalent (PRE) of 2304 is 26 – slightly higher than that of SUS 316 and this is confirmed by actual pitting and crevice corrosion behaviour. It has similar resistance to sea water as grade 316. Grade 2304 is also resistant to chloride stress corrosion cracking (SCC) at temperatures of up to over 100°C. It will often perform well in environments which cause premature failure of austenitic grades. Although 2304 has good high temperature oxidation resistance this grade, like other duplex stainless steels, suffers from embrittlement if held at temperatures above 300°C. 2304 resists this high temperature embrittlement better than other duplex grades but the effect will still occur after about 10 hours at elevated temperatures. If embrittled this can only be rectified by a full solution annealing treatment. Duplex stainless steels are almost never used above 300°C. Heat to 1020-1100°C and cool rapidly. This grade cannot be hardened by thermal treatment, but does work harden. Weldable by all standard methods, but it should not be welded without filler metal as this may result in excessive ferrite. AS 1554.6 pre-qualifies welding of 2304 with 2209 rods or electrodes to ensure that deposited metal has the correctly balanced duplex structure. Nitrogen added to the shielding gas will also assist in ensuring adequate austenite in the structure. Heat input must be kept low and no pre- or post-heat should be used. The lower co-efficient of thermal expansion of all duplex stainless steels compared with austenitic grades reduces distortion and associated stresses. The high strength that makes 2304 useful in many applications also reduces its machinability, but not as much as for duplex grade 2205. Machinability of 2304 bars in some operations is not as good as for 316 and in other operations it is in fact better to machine. Poor chip breaking can result in rough finishes after some operations. The high strength of 2304 also makes bending and forming more difficult; these operations will require larger capacity equipment than would be required for austenitic stainless steels. The ductility of 2304 is less than that of an austenitic grade (but is not low when compared to most other structural materials), so severe forming operations, such as cold heading, are not generally possible. If severe cold working is required it is recommended that intermediate annealing be carried out. 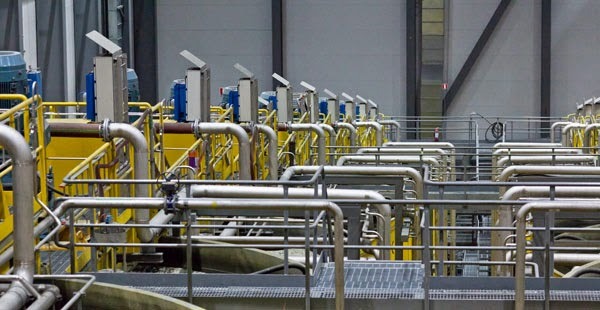 Chemical processing, transport and storage. Oil and gas exploration and processing equipment. Marine and other high chloride environments. Pulp & Paper digesters, liquor tanks and paper machines. 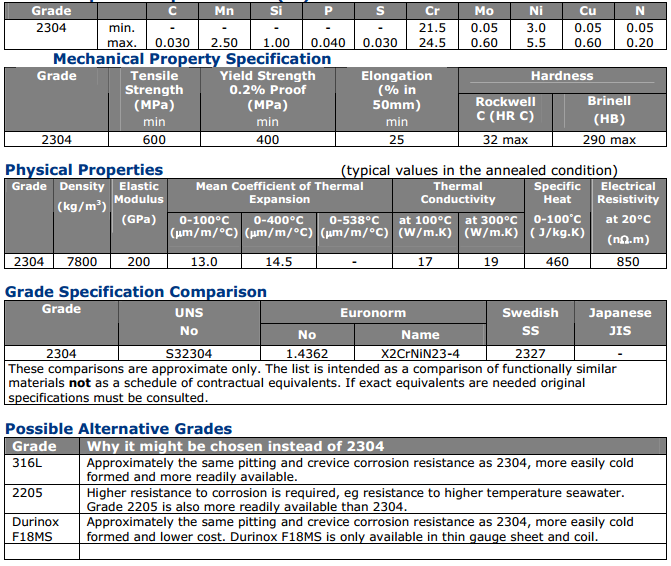 These properties are specified for Grade 2304 (S32304) flat rolled product (plate, sheet and coil) in ASTM A240/A240M. Similar but not necessarily identical properties are specified for other products such as pipe and bar in their respective specifications.